When developing situation awareness applications we begin by constructing an OWL ontology to capture a language of discourse for the domain of interest. 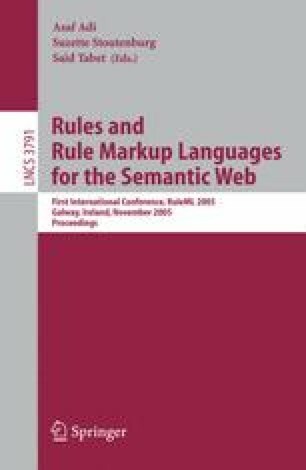 Such an ontology, however, is never sufficient for fully representing the complex knowledge needed to identify what is happening in an evolving situation – this usually requires general implication afforded by a rule language such as SWRL. This paper describes the application of SWRL/OWL to the representation of knowledge intended for a supply logistics scenario. The rules are first presented in an abstract syntax based on n-ary predicates. We then describe a process to convert them into a representation that complies with the binary-only properties of SWRL. The application of the SWRL rules is demonstrated using our situation awareness application, SAWA, which can employ either Jess or BaseVISor as its inference engine. We conclude with a summary of the issues encountered in using SWRL along with the steps taken in resolving them.